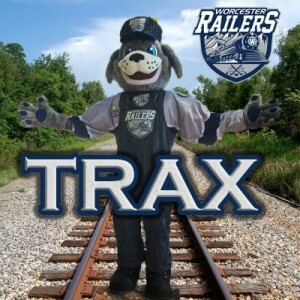 After much deliberation, over a thousand online submissions, and a weekend long poll of the top three names, the Railers HC debut Trax, the railyard dog who will call the hockey ice his new home. 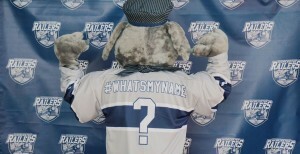 Railers HC wanted to get the community and the fans involved in choosing the new mascot’s name. The mascot was revealed after plenty of social media hype at the Bravehearts game on July 30th, 2016 wearing a jersey with not a name but a hashtag. #WHATSMYNAME became the start of searching for the perfect fit. Partnering with MassLive, Railers HC put out a contest, allowing fans to submit their favorite mascot names with a Red Sox prize pack granted to the winning name. After hundreds of submissions were reviewed, the top three were revealed over social media, with a message to share and like their favorites over the weekend in preparation to pick a winner. The winner of the grand prize, Scott Johnson, was the first to enter the name TRAX in the MassLive contest. There was an overwhelming response for the name across social media with over a thousand comments, likes, and shares. Trax will be a friendly and loyal pup that both kids and parents alike can interact with and enjoy. He has already made his way around the Worcester community, visiting places such as the Ecotarium, The Friendly House, YMCA’s, and sponsoring the Canal District Music series. He will be present during all home games, taking pictures and cheering on his favorite team, The Worcester Railers, of course! Jump aboard the train and help us welcome Trax to Worcester! 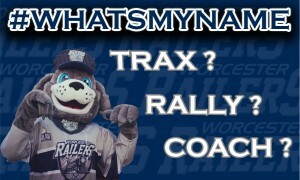 To follow Trax around social media, you can follow him at…..
HC Member Spotlight: Judi Dionne POW WOW Worcester and Railers HC Can-tribution!